Precipitation is rain, sleet or snow, or bringing an action on suddenly. 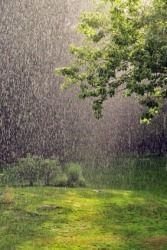 An example of precipitation is rain. "precipitation." YourDictionary, n.d. Web. 13 April 2019. <https://www.yourdictionary.com/PRECIPITATION>. a depositing of rain, snow, sleet, etc. a. Any form of water, such as rain, snow, sleet, or hail, that falls to the earth's surface. b. The quantity of such water falling in a specific area within a specific period. A hastening or acceleration, especially one that is sudden or unexpected: He is responsible for the precipitation of his own demise. A headlong fall or rush. Chemistry The process of separating a substance from a solution as a solid. A form of water, such as rain, snow, or sleet, that condenses from the atmosphere, becomes too heavy to remain suspended, and falls to the Earth's surface. Different atmospheric conditions are responsible for the different forms of precipitation. The process by which a substance is separated out of a solution as a solid. Precipitation occurs either by the action of gravity or through a chemical reaction that forms an insoluble compound out of two or more soluble compounds. (meteorology) Any or all of the forms of water particles, whether liquid or solid, that fall from the atmosphere (e.g., rain, hail, snow or sleet). It is a major class of hydrometeor, but it is distinguished from cloud, fog, dew, rime, frost, etc., in that it must fall. It is distinguished from cloud and virga in that it must reach the ground. (countable, chemistry) A reaction that leads to the formation of a heavier solid in a lighter liquid; the precipitate so formed at the bottom of the container.